Manitowoc, WI- Kurt Dramm talks with passion when he describes how his company uses fish scrap waste to help customers create stronger, healthier plants. �I see a huge growing acceptance of this product. It is so good for the environment, but also produces wonderful results on plants. It is really a win-win situation,� said Dramm, president and owner of the Dramm Corp.
Its �Drammatic Liquid Fish Fertilizer� caught the eye of the Wisconsin Environmental Working Group, and Dramm�s was one of 32 companies statewide to be nominated for a Wisconsin Business Friend of the Environment Award last month. Dramm said the production of Drammatic fish hydrolysate annually converts about 1.5 million pounds of fish scrap waste into an environmentally friendly product. The scrap waste is mostly from leftovers of commercial salmon fishing operations on the Great Lakes. If it weren�t for the processing of the scraps at his 7,000-square-foot plant in Algoma, the fish waste would just add garbage to already crowded landfills. �Many farmers tell us (the fish fertilizer) suppresses insect attack. When you foliar feed (spray it on leaves), it raises the sugar level of the plant, (and) seems to deter aphids,� Dramm said. He said when the product is applied to the soil, it feeds the soil web of microbacteria and fungi. Plants able to fend off insects and plant diseases helps to decrease the levels of pesticides applied. �It is a known fact that farmlands have been over-fertilized, resulting in the seepage of nitrogen into the groundwater and runoff of phosphorus into ponds, causing an algae bloom,� Dramm said. He uses his own product at the former Sexton House at Evergreen Cemetery, leased by Dramm Corp., to demonstrate its effectiveness. �We have a New Guinea Impatiens bed. I treat half with the fish (fertilizer) and don�t treat the other half, (then) show people the difference. �With a very small amount, one ounce in two gallons of water, a 1:256 ratio, we have a much bigger, tougher, stronger leaf,� Dramm said. 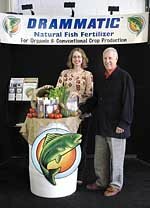 For those who would like to reduce the frequency of mowing their lawns, Dramm has a suggestion � use his fish fertilizer. �You won�t have the lush, explosive growth like with a nitrogen (fertilizer) and the grass will be a lighter green, but it will be more drought resistant in the summer and you don�t have to cut your lawn every week,� Dramm said. From its beginning, Dramm Corp. has been an environmentally concerned company, serving the horticultural industry for 60 years. It manufactures watering tools and drip irrigation products designed to conserve water and reduce pesticide use and runoff. It sells 5,000-gallon tankers and 55-gallon drums of the liquid fish fertilizer to organic growers of grain, soybean and cranberries in the Midwest.